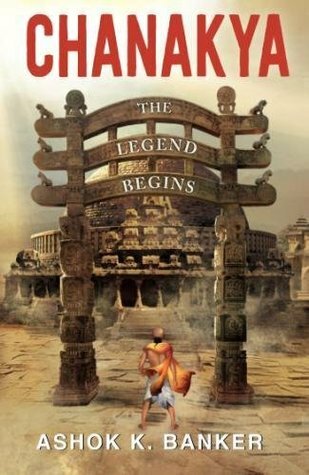 STORY: Ashok K. Banker in the first installment of his historical fiction series, the Chanakya trilogy, introduces us to the legendary figure as a young boy of 7 years age, also called Vishnu Gupta. Far from his home, in the city of Pataliputra, there’s a minister (Maha-Amatya Kartikeya) who rules by brute force and evokes great terror in the minds of the citizens. When Vishnu and his family head to Pataliputra for a congregation, his life gets bound in the chains of wanting to protect his family and doing the right thing. REVIEW: I’ve always been intrigued by Indian historical fictions related to characters from the epics. And this one was such a wonderful read! I finished reading it in one day. The plot presents certain broad themes of battle between good and evil, importance of knowledge, tradition, monarchy etc. But the narrative that fills in the blanks is so refreshing because it draws a profile of an individual we’ve come to see as a master-thinker, a guide to Bindusara and Chandragupta Maurya. So to read about Chanakya as a 7 year old was so fulfilling. He has been portrayed as a boy who was extremely intellectual and had great powers of logic, understanding, far superior than the gurus and adults of that time. At times the maturity he displays can stupefy you; after all how often do you find children or even teenagers nowadays with such clarity of thought. The pace of the novel is fast and gripping. There are a few Sanskrit terms used here and there, but they enrich your reading experience all the more. The language used in this novel is quite suitable for intermediate readers. If you are not very well versed in English, you might want to keep a dictionary at hand. That said, you must read Chanakya by Ashok K. Banker. It is a splendid read, one that I highly recommend! I simply CANNOT wait for the second book in this trilogy. WHAT DO YOU GET OUT OF IT: An engaging tale of how Chanakya’s intelligence held him in high stead and brought him face to face with corrupt leaders. Jasmine Days tells the story of Sameera as she gets accustomed to living in a Middle Eastern city with her father and relatives. This shift away from home and her new job as an RJ brings her closer to assimilating with people of different backgrounds. Her friendships take on new definition when the city gets torn apart by religious conflicts. In this contemporary fiction, the author draws up a raw and gritty picture of the effects of communal tension and violence. This novel surpassed my expectations and grew on me rather quickly with its unusual style of narrative and the subject matter it dealt with. Politics and religion are not themes that make for an easy read, but Jasmine Days has the power to keep you hooked to its pages. The apprehensions of being an outsider, the inevitable culture shock and the patriarchal notions concerning gender roles are all aspects of the plot seen through Sameera’s perspective. The style of writing in this translated work is crisp and not flowery. Many disjointed events and instances are strung together to form the overall story. There are no chapters, only subheadings within broad sections. 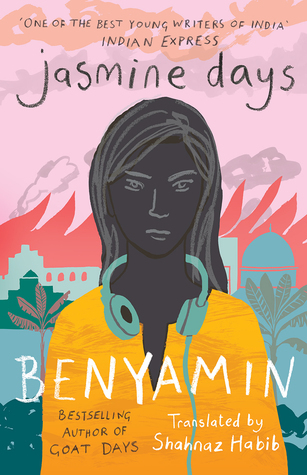 In a way of recounting incidents that gave rise to the growing rivalry between communities, the novel draws your attention towards the Arab Spring. Themes of corruption, religious intolerance, women’s rights and protest culture are explored in this novel. It also addresses the topic of media transparency during conflicts; how people in power become gatekeepers of news. There are a lot of characters in this novel, only a couple of which take precedence over the others. Sameera has firm opinions about what’s right or wrong, she enjoys music and has never really considered what her religious identity might mean on a larger scale. Jasmine Days brings out the jarring truth about revolts; how innocent people have to bear the brunt of the actions of a few. I CANNOT STRESS THE IMPORTANCE OF THIS BOOK ENOUGH. Highly recommend reading it!! What do you get out of it? A moving story about individuals caught in an uprising, not knowing if they are safe within their own homes. Thank you Juggernaut for sending me a copy of this book in exchange of an honest review. After the recurrent Padmavati (now Padmaavat) debacle, I was really intrigued to see what all the fuss was about. Why were entire communities dead against its release? And now, having seen the film, I am no closer to answering that question. For the life of me, I can’t fathom what the issue is. In a nutshell, for the uninitiated, the film Padmaavat is a historical fiction that captures the might of the Rajput clan – women and men alike – in the face of a foreign invasion. Alauddin Khilji, the mad king of the Khilji Dynasty threatens to declare war on Chittor, Rajasthan. The story that propels the movie has been drawn from actual historical events but the film goes the extra mile with its dramatic flair and fictionalization. Now, I’m in no position to tell which parts of the movie are based on true happenings (and neither are a lot of people who have a problem with the legitimacy of this movie). But that’s the point! It’s a movie, people. Made for entertainment. If you’re looking to watch an account that is completely true, perhaps you should watch a documentary? That being said, the story reached out of the big screen and spoke to me. It cradled my cynical self in an embrace of deep pride for a civilization that has fought to keep its ground. It affirmed my respect for kings, queens and warriors who have had to undergo a multitude of sacrifices to keep us going. And in my honest opinion, it did not glorify practices like Sati/ Jauhar. The last scene where countless women stride towards a fiery end was more about their dignity as Rajput women, refusing to be captured and enslaved by the Khiljis. It was about an astonishing strength that allowed them to welcome death; thereby taking control of their destiny. As I sat in that theater, rooted to the spot, I didn’t for once think “wow, we should bring back such ancient practices.” I felt emotional that these women had no other choice during that time. I felt angry at those invaders and on the whole, my nationalist sentiments were pretty high up. Ranveer Singh lives and breathes his art. I’m sure donning the skin of a crazed emperor from the 13th century was no easy feat. But somehow, Ranveer makes it look effortless and all too convincing. When I think of the movie now, his performance as Alauddin Khilji is one of the things that stands out the most; his maniacal laughter, the grungy get up and the arrogance of a ruler who felt entitled to the best of the best. I had no doubts in my mind about Ranveer Singh being an exceptional actor (my all time favourite! ), but in this movie, he surpasses expectations. On the other hand, Deepika Padukone brings a grace and fierceness to her character, Maharani Padmavati, like no other could. Sometimes it bothered me that women of those times were reduced to being subservient to the man of the house. But that’s a commentary on societal and gender norms, not Bhansali’s film. The fleeting moments of romance between Maharawal Ratan Singh (enacted by Shahid Kapoor) and Padmavati helped glaze over a movie that otherwise, would have been just about politics and war. Shahid Kapoor brings so much power to the role of Ratan Singh. His acting coupled with the ornate dialogues packs a punch that is much needed in a historical narrative. The cinematography is to-die-for! All those scenic shots of the palace, the aerial view of the armies and the incredible clips of the music-dance sequences made me love Padmaavat even more. I’m definitely going to be watching it again and again and again. To conclude, this movie glorifies the Rajputs, imbuing them with such strength of character. It dissects the disposition and mindset of Alauddin Khilji, making you detest him and simultaneously be appalled by his conduct. I had been anticipating watching this film for so long and now that I have, I’m extremely happy. So I don’t understand the abhorrence and I don’t understand the harsh criticism. I just wish that it had gotten better reception and that the hard work that went into its making is fully appreciated. We have a rich cultural heritage and a country filled with beyond talented artists. Can we not be toxic amongst ourselves and work to reach a point where we can once again be a glorified nation? Let our art speak volumes about our traditions and values. Not about hate. There’s always a first and no matter how exhilarating or painful that first experience is, you’ve just started cracking open the shells to usher in the beams of a better world; a world of heightened senses and worldly knowledge. So keep going, oh brave heart, keep going! 2017 has been a great many things to me, as I’m sure it has been for you. It was an unexpected U-turn, a heartbreaker, a wise fool who reminded me just how transient everything is and a devil who missed not one chance to fill my head with doubts. But amidst all that, my self-love and the desire to be true to myself is the one thing that was of supreme importance. This year was also testament to my innate nature of biting more than I can chew. I piled up so much work on myself and although I was able to accomplish a majority of them, it was a stretch. Perhaps the next year, I’ll learn how to pace it out. But who am I kidding? I’ll probably still be up at 4am trying to finish an article or a book for review. Like everybody else, this year has attempted to bowl me over with certain happenings. And had I allowed it to devastate me, I wouldn’t have realized some very important lessons. The key is to never lose faith in yourself. Then, you’ll be just fine. The tips, tricks and cheat codes lie within you. So look there, and you’ll find that you have everything that you need to conquer each day. In terms of getting tattoos and reading books, I’m not as pleased as I wanted to be. I had planned to get a couple more inks and read atleast 50 more books, but somehow, I just didn’t. Falling short of ticking off those goals has made me all pumped up to race into the next year with a great start. What I am exceptionally proud of is sticking to my Bullet Journaling. It has enabled me to keep track of my daily habits, goals and to-do lists in a very creative manner. For that I commend myself. Finally, on the education front, I’m so glad to say that I got my first level Korean Language certificate. Now, my inner thoughts are as much in Korean as they are in English. Tons more to go before I’m entirely proficient, but this is one of my most cherished milestone of 2017. Lastly, I’m gradually becoming more attuned to what’s happening around the world. While it’s all very alarming, I still have hope for us humans. And I wish to actively bring about a change in whatever way I can. Note to self – create content for awareness and positive change! I hope 2018 is filled with as many ups and downs as 2017 has been. I hope that in between tears and laughter, I continue to recognize the privilege I enjoy. And I hope that I’m able to spread the love to others, that I have been fortunate enough to receive. A friend of mine once said, “Being close to somebody is about how they make you feel.” This couldn’t be more true. We cling to the people who make us feel strong, special and worthy of good things. We gravitate towards those who can give us what we’re looking for from life – be it fame, money or just a social circle to fall back on. But what happens when, as time passes, they’re no longer the person you used to identify with? Maybe you feel the need to justify their changed behavior and you are wont to accepting them nevertheless. But there’s also a fair chance that you just can’t “go with the flow”. And that’s okay. Like me, you may be standing at that point in life where your only human interactions are with your family (if you’re an adult living with your folks, that is) and/or select friends via social media. You may be wondering what happened to all those hour long conversations with your bestfriend(s) from school or college. You may be seeing them in a new light. In between all that, you may also be questioning yourself as to “What went wrong?” The answer is nothing. It’s not up to you or me to prevent someone from being who they wish to be. Neither are we obliged to deal with a relation that has grown toxic. All of my experiences has taught me one important thing, amongst others. If you appreciate or value somebody, make sure they know it. Cause there will come a time when engaging in small talk with said person would be a strain. We’re all caught in the throes of keeping up with today. And so it’s only likely that we would grow and flourish in the way we know how to. It’s only likely that people will grow apart for a hundred different reasons. A shuffle in priorities, conflict of interests, distance and on goes the list. But you can’t possibly hold it against them for choosing to walk away or yourself. In a world of no-strings-attached, guarded conversations and rising number of online “followers”, you ought to consider yourself lucky for having enjoyed something meaningful, even if for a short while. Sometimes, bestfriends become strangers and families get estranged. That’s how it is. This is something I should have understood a long time back. Perhaps, it’s something you’d like to hear now. Anyhow, the festive season is here and I truly wish y’all a fantastic end to this year! By the magnanimity of your kind, kind soul. You’ve only learnt to give. A forgiver of uncounted errs. The most roiling of behaviors. To be persistent and genuine. It is my turn to give. Do all that your heart desires. The most beautiful woman I know. It Has Been 5 Years. Five years have passed since I started this blog, since I battled indefinite bouts of laziness. Five years of unimaginable change, not just in myself but in my surroundings. I’ve grown accustomed to this change; to never declaring any possibility as absolutely improbable. For I’ve turned the tables more times than I’d thought myself capable. But amidst all that change, there’s one thing I’ve ascertained – my love for reading and writing is entwined into my being. It gives me such joy! A part of me applauds that I haven’t given up blogging (With two previous failures and a mastery of procrastination, what else could I expect?) But writing has always been a balm, a friend like no other. I could lose myself in analogies and alliterations all day long, immortalize my concerns and curiosities. I can’t get enough of the joy of explaining my writings to those who’ve just skimmed the surface of it. I can’t get enough of putting my berserk ideas on an online platform, even if nobody truly understands it. Maybe the magic of writing is just that. It doesn’t expect anything of you. In fact, it is the one true thing that embraces who you are. I have been blogging about books and writing poetry for a long long time. There’s more to me than that and I’d like to be consistent with introducing new elements on my blog. But until then, I’m glad I have this… The fifth blog anniversary. Much like the cover of Steel’s Dangerous Games, the title of this one is embossed in gold, attributing all the power to it. The family of five huddled together, against the backdrop of the city’s skyline sends across a strong message. To me, it speaks of unity, blood ties, finding a sense of belonging etc. The fact that they are all gazing in a specific direction (a.k.a observing something) could mirror how a family helps you grow and learn..